Sometimes the right tool for the right job is too long to dispose of easily after use. Biohazard contaminants left on these tools can be a sizeable danger. What is our real solution to this real problem? The Whitney Medical Solutions' Pipet Keepers. Our biohazard Pipet Keepers easily and conveniently collect biohazardous waste up to 15" in length right at your workstation. Priced lower than sharps containers, the Pipet Keepers are readily disposable making it easier to maintain high lab standards. 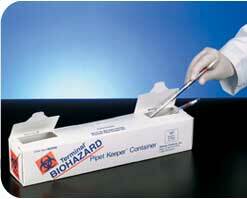 Pipet Keepers are made of sturdy paperboard printed with orange biohazard symbols. Self-locking tops keep contents safely enclosed and re-closable flaps make the Pipet Keeper easy to use whether you are right or left handed. Pipet Keepers store flat – requiring far less space than rigid plastic containers and the interlocking flaps make them easy to fold into shape. Pipet Keepers have a plastic lining to hold a moderate amount of liquid. Autoclave contaminated materials inside the container and dispose of container according to your local, state or federal regulations. Interested in making your lab area cleaner and safer? Contact us for a free sample of our innovative disposable waste container solutions for labs.